We have seen images move across and around the screen in curved paths, speeding up and slowing down in graceful motion. This animation process can be done in FCP. 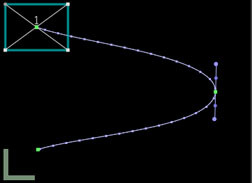 We can create flowing motion with speed changes by working with motion paths and Bezier handles. Before we can sculpt our motion paths we have to create them so we will animate a video clip to work with. We will accomplish this by changing the position of the image over time by setting Keyframes. I am going to use a video clip for this example but I can use any image from any source like Photoshop. My art can be a photo, text, or anything I want. I drop a clip onto the TimeLine and double click on the clip to load it into the Viewer, I then select motion tab in the Viewer. In working my example I will use both the motion tab to set Keyframes and the Canvas window to position my image by dragging the image to my desired position. In my Canvas window I set my drop down menus to image size 50% and 'image + wireframe'. I have started by using a full video clip at 720 x 480 but in order to be able to move it around the screen I am going to have to reduce it's size. I move my playhead to the first frame of the clip. Clicking on the image in the Canvas activates the 'image + wireframe'. I click on one of the four corners of the blue bounding box (Blue arrow) and drag in until I have reduced the image to the size that I want. Placing my cursor on the image turns it into a move tool (Red arrow). The First frame marker also shows (Green arrow). You can size your image by entering a numeric value, like 25%, in the scale box in the Motion tab. You will need to set a Keyframe by clicking on the Keyframe button in the scale section. With my Move tool I click and drag my image to place it in it's starting position. Looking over at my motion tab I can see that my image size has been scaled down to 25%. Looking at the 'Center' section I can see the numerical value for the new position that I have given my image. 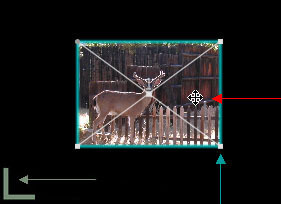 With my image scaled and positioned and my playhead at the first frame I set a keyframe in the motion tab in the 'Center' section, the Keyframe button turns green (Green arrow). This will be the starting position for my animation. I know that half way through the clip I want my image to move across the screen and down. In the TL I place my playhead at the mid point of my clip. In the Canvas using the Move tool I click and drag my image to it's second location. As I drag my image a purple 'motion path' is being drawn (Purple arrow). When my image is in position I release the mouse button, FCP sets a new, second Keyframe for me (Green arrows mark first and second Keyframes). I want one last movement for my image so on the TL I move my playhead to the last frame. Again using the Move tool I drag my image back across the screen and position it at the bottom of the screen. When I release the mouse button my third Keyframe (Green arrow) is set for me. We can see that a second motion path has been drawn between the second key frame and third Keyframe (Purple arrow). Lower right hand corner is the last frame marker. Hey, this looks a lot like Picture in Picture without the background picture. 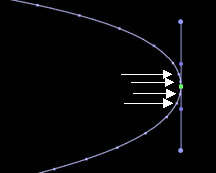 Okay, my motion path is in place, now I can get down to the subject of this article motion Paths and the Bezier Handle. To do this work I have changed my Canvas from 'image + wireframe' to 'wireframe'. I have my motion path but look at it, it's ugly, no finesse. If played, the image would start out at full speed, when it got to the end it would stop instantly. Not very real world. 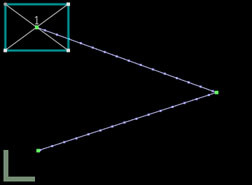 We will change both the shape of the motion path and the speed of the image as it moves from Keyframe to keyframe. Control clicking on the second Keyframe will produce a contextual menu. From this Menu select 'Linear'. There is our Bezier handle. You can see that the shape of my paths has been changed from a hard angle to a curve. Better already but still not what I want to end up with. Let's look at this thing called the Bezier handle. 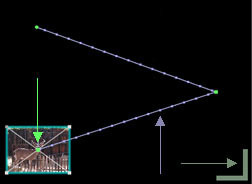 This long shaft is centered on the Keyframe (Green arrow). At the ends of the handle are purple dots which I call the 'shape control' dots (Red arrows). Closer to the center of the shaft are two smaller purple dots that I call the 'velocity' dots (White arrows). On the motion path are still more, even smaller purple dots (Yellow arrows). Don't know what to call these things, Apple calls them 'ticks' but I think that 'speed bumps' would be more appropriate, more on this later. When I place my cursor on either one of the two 'shape control' dots (Red arrows) on the Besier handle it turns into a crosshair, I can now click and drag the shape control dot left or right. Doing this changes the angle of the curve. I can drag the shape control dot up or down the shaft, this changes the depth of the curve. Think of it as being a joy stick. As you move the shape control dot you will see the other shape control dot, at the other end of the handle, moves equally. This enables you to shape the motion path on both sides of the Keyframe at the same time. 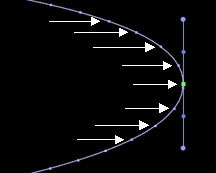 If I want to reshape only one side of the Bezier curve I can hold down the Shift key and drag. 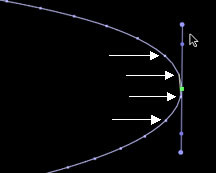 To change the angle of only one side of the Bezier curve hold down the Command key and drag. To change both the shape and angle of only one side of the curve hold down the Shift and Command key then drag. If I want to remove a Bezier curve and it's associated handle Control click on the Keyframe and from the Contextual menu select 'make corner point'. This will return your Keyframe motion path to it's original shape. 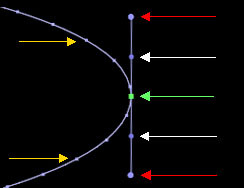 Clicking on the shape control dot and dragging around in a circle one full revolution will cause the motion path to turn into a loop, like a rollercoaster. I can also set Bezier handles on both my starting and ending Keyframes. This will produce a one sided Bezier handle but the controls will work the same. You can see that I can really create almost any shape I want for my motion path. 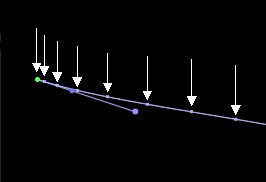 I can further enhance the shape of my motion path by adding new Keyframes anywhere along the motion path. If I place my cursor on any of the small purple dots on the motion path that I call 'speed bumps' my cursor will turn into a Pen tool. When I click with the Pen tool a new Keyframe will be added with Bezier handles. 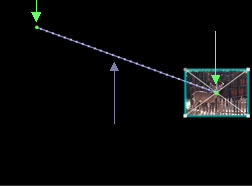 To remove a Keyframe from the motion path place your cursor on the Keyframe, control click and choose 'delete point' from the contextual menu. At any time you can place your curson on any Keyframe and click and drag the keyframe to a new location. As I work I often want to preview my motion path. 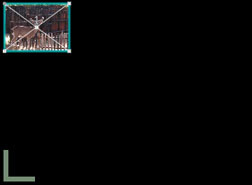 As I am in 'wireframe' only there is no image for FCP to redraw to the screen. This means that if I hit 'Option' and 'P' from the keyboard (turn snapping off) FCP will play my wireframe from start to finish in real time without the need to render. When I play my clip the image will move along the motion path at a fixed rate of speed. The clip will jump to full speed when starting out and will come to an instant stop when it hits the last Keyframe. I want to be able to control the acceleration and deceleration as it approaches a Keyframe. This is where those small purple 'speed bumps' found on the motion path come into play. When these speed bumps are spread out evenly along the motion path the clip will move at a constant speed. When the speed bumps are closer together the clip will move more slowly as it now has less distance to travel between each bump. If the speed bumps are moved further apart the clip will speed up as it now has a greater distance to travel between each of the speed bumps. I can change the speed of the clip as it travels along it's motion path. I can accelerate or decelerate the clip for better looking motion. But these speed changes have to be taken in context. If my clip is 8 seconds long, then no matter what I do with my speed, the clip will still be 8 seconds long. If I have 3 seconds between two Keyframes the duration will remain 3 seconds. There is no change to the duration of the clip or the time between Keyframes. The speed changes that I am talking about happen between Keyframes. If I start my clip out slowly at first then further along the motion path before the next Keyframe the clip will speed up to compensate for the slow start. If my clip decelerates before coming to the last Keyframe then somewhere on the motion path between the last Keyframe and the second to the last Keyframe the clip will run faster. For every slow down there is an equal speed up. Both events will occure between two Keyframes. In FCP there are two different ways to alter the distance between speed bumps, two different ways to change the speed of a clip. The first way is a simple 'pre-set' that is normally used on either the starting or ending Keyframes, or both. This is called 'ease in/ease out'. What this does is start a clip out moving slowly at first then picking up speed as it moves down the motion path, or slowing down when it comes to the last Keyframe. It is available by control clicking on the starting or ending Keyframes and selecting 'ease in/ease out' from the contextual menu. 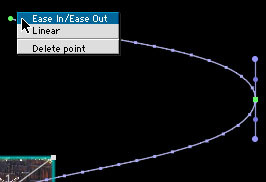 To remove ease in/ease out control click on the Keyframe and select 'make corner point'. While 'ease in/ease out' from the contextual menu is used for motion paths and can be applied in the Canvas window we can apply this same effect to the other attributes found in the Motion Tab. By Control clicking on any Keyframe in the right hand side of the Motion tab and selecting 'Smooth' from the contextual menu we will get Bezier handles for; Scale, Rotation, and other Keyframable-able attributes. The second way to change the speed of a clip is to use the 'velocity' control dot on the shaft of the Bezier handle (White arrows). Placing my cursor on the velocity dot turns it into a crosshair. If I drag up the speed bumps will move further a part which would cause the clip to move faster, if I drag down the speed bumps will move closer together causing the clip to slow down. I know that all this can seem a little daunting at first but I promise you it's not rocket science. Set up a clip, create a motion path and play with the Bezier handle, shape and velocity, once you get the hang of it you'll have fun. Remember that you can play your 'wireframe' in real time (Option P from the keyboard) without rendering so you will be able to see how it looks as you work, well, in wireframe anyway.